In my blog post last week, I recommended that people see Emilio Estevez’s film The Public when it is available in their community. This week I MUST follow up that recommendation with another. Won’t You Be My Neighbor?—a film about the life, work, and empowered positive impact of the amazing Fred Rogers—is a touching, sweet, emotional, and illuminating film about a man who made an incredible difference in the lives of countless young children and their families. I have always remarked that one attribute that separates educators from (many) other adults is that we care about other people’s children. School librarians whose “kids” are all the young people in their schools must have expansive hearts to accommodate the personal and academic needs of all the youth we serve. Effective and caring school librarians create a climate of welcoming acceptance in the library that extends out into the school and into the surrounding community. We achieve that through library programs that affirm diversity, insist upon equity, and strive to help all learners (students, educators, and parents) achieve their capacity to think, create, share, and grow. This film made so many connections for me with our work in school libraries. These are just a few of them. In the themed episodes for Mr. Rogers’ Neighborhood, Fred addressed children’s feelings about war, divorce, race, and other timely topics. He did not talk down to children. He did not shield them from the realities of their lives because he respected their intelligence. Fred Rogers was a courageous educator and friend to children. Today’s educators should be as courageous in helping learners express their feelings and deal with real-world problems and issues. Our daughter watched Mr. Rogers’ Neighborhood is the 1980s. I distinctly remember the pace of Mr. Rogers’ show compared with other children’s programming at the time. It was slower, in many ways more thoughtful, and allowed viewers thinking and feeling time. With today’s focus on academic, social, and emotional learning in many schools and districts (see CASEL), there is much for educators to consider in terms of a slower pace. We can carve out the necessary time students need to integrate their learning into their lives by making time for reflection and time for sharing with others. The Guided Inquiry Design Framework (Kuhlthau, Maniotes, and Caspari 2012) that includes sufficient time for students to immerse themselves in questions of their own making acknowledges the emotional aspects of learning. As Carol Kuhlthau (2013) found in her research on the information search process, inquirers pass through various emotions as they pursue learning. If Fred Rogers had known about inquiry learning, I believe he would have agreed that such a process is respectful of learners’ emotions as well as their intellect. This is a vivid reminder that when we are advocating for school library programs that help all learners succeed, our knowledge and data do matter. But it’s our stories that touch the heart; they are most often the aspect of our advocacy work that helps people make difficult decisions. Changing people’s minds through their hearts works. These are some of the quotes from the film that made powerful connections for me and may serve as words of wisdom for today’s educators. “’Won’t you be my neighbor?’ Well, I suppose it’s an invitation. It’s an invitation for somebody to be close to you” (Fred Rogers). “Love is at the root of everything – all learning, all parenting, all relationships. Love or the lack of it. And what we see and hear on the screen is part of who we become” (Fred Rogers). “Someone smiled you into smiling; sang you into singing; read you into reading” (Fred Rogers paraphrase from the film to the best of my memory). I believe that educators can care students into caring about their own well-being, the health of our/their country, and the future of our planet. 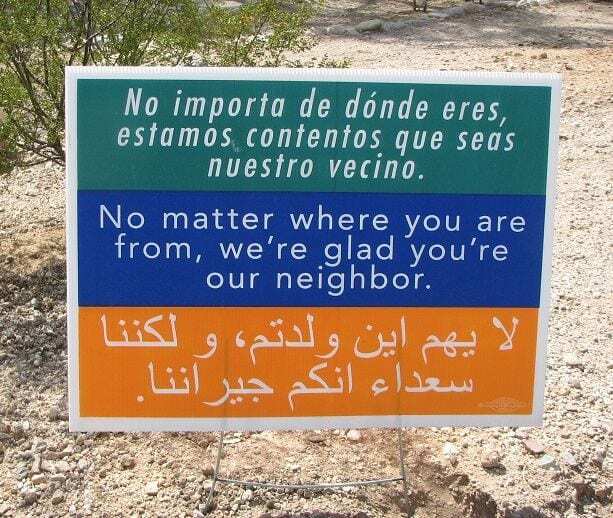 When we care for our “neighbors,” we model the empathy that is essential for living, working, and succeeding in a global society. Thank you, Mr. Rogers, film director Marvin Neville, the film’s producers, and others who brought Fred Rogers’ knowledge, perspective, and heart to the screen. I also believe we become what we see and hear on the screen. I want Won’t You Be My Neighbor to be part of my becoming. Collaborative for Academic, Social, and Emotional Learning. “CASEL: Educating Hearts. Inspiring Minds.” www.casel.org. Kuhlthau, Carol Collier. 2013. “Inquiry Inspires Original Research.” School Library Monthly 30 (2): 5-8. Image Credit: Sign distributed by Peace Centers across the U.S. Question to the Internet Movie Database: What does it take to earn a ten?